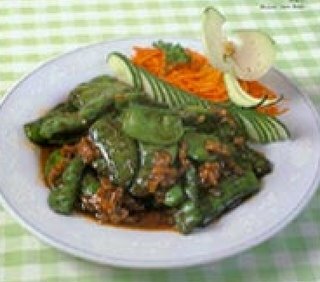 Braised Green Beans is Chinese Vegetarian Food. This is a vegetarian dish that has wonderful fresh flavor. This menu for vegetarian and most famous of China, it’s easy for cooking and delicious. And then use in period Kin Jay festival. That is good idea for Vegan. 1. Cut each of the green beans into two sections and the soaked red chili into sections about 1 cm (0.4 inch) long. 2. Heat the oil in the wok 110-135ºC (230-275 ºF). Stir-fry the green beans for 2 to 3 minutes and take out. 3. Keep 25 g (1 2/3 tbsp) of oil in the wok to fry the scallions and ginger until they give off a strong aroma. Add the green beans, stir several times, put in the spicy bean paste, vinegar, red chili, sugar, soy sauce and water and simmer for 10 minutes. When the soup turns red, turn the fire up strong so as to boil off some of the liquid. Add the mixture of cornstarch and water to thicken the soup, sprinkle the sesame oil and put in a serving plate. Features: The taste of the ingredients is fully absorbed into the beans. Taste: Sour, spicy, salty and delicious. Enjoy your cooking for Chinese vegetarian food.